While last year's tax overhaul was in part aimed at bringing US money back from overseas, 2017 also saw a big jump in American investment abroad. 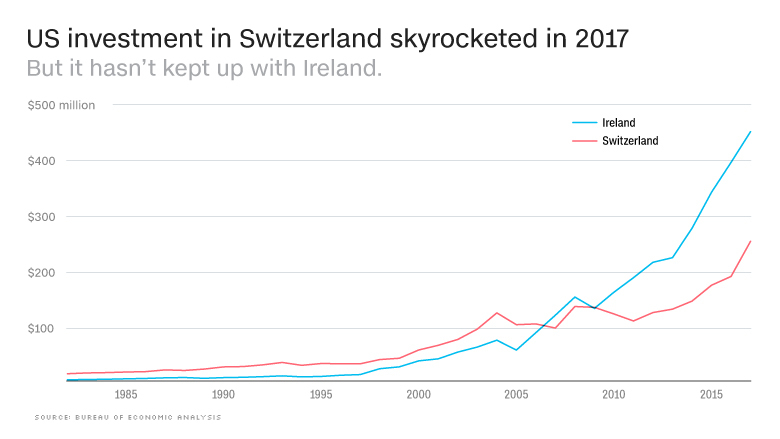 The biggest new beneficiary: Switzerland. According to annual statistics released Monday by the Bureau of Economic Analysis, the total amount of US money invested abroad grew by $427 billion in 2017, or 7.6%. Most of that increase went to Europe, and $63 billion of it to the Swiss, bringing the US cumulative investment in the country to about $250 billion. That number counts investments in foreign businesses that constitute more than 10% voting ownership. It does not capture US money deposited in Swiss bank accounts, which amounted to $168 billion in 2017, according to the Swiss National Bank. Oliver Hohermuth, who heads the Dallas office of the Swiss investment adviser Reyl Overseas, says he's seen a surge of interest from US investors in opportunities in Switzerland. "I think recently it has been rediscovered by Americans," Hohermuth says. "It's a good way to diversify, and to be a little bit more segregated from the high volatility that we've seen in the US market in the past few years." Swiss industrial companies have been expanding quickly in emerging markets, Hohermuth says, providing an attractive investment vehicle for wealthy Americans. Also, he believes that the 2010 Foreign Account Tax Compliance Act and a subsequent crackdown by the US Justice Department improved transparency in the notoriously secretive Swiss banking industry, allowing US companies and individuals to invest in Switzerland without looking shady. "There's no possibility to hide any money in Switzerland," Hohermuth says. "Today everybody knows that everything is above board." The relationship goes both ways. Switzerland has also increased its investments in the United States over the years, and now holds $309 billion in American assets. Although Switzerland saw the largest increase in US investment last year, it's a relatively small player overall. The biggest destination for American capital is the Netherlands, followed by the United Kingdom and Luxembourg. US money has also poured into Ireland over the past five years, drawn by a low corporate tax rate. About half of the US investment position overseas is housed in holding companies, which may hold shares of many different firms. The second largest share of US investment goes towards manufacturing companies. Over the years, US foreign direct investment has grown much faster than international investment in the United States, and now totals about $6 trillion. That trend may slow in 2018, if US companies take advantage of their home country's new lower corporate tax rate.